Activities are things that can happen as a result of a request Entity entering a State or following a Transition. For example, let's see the diagram from Part 1 again. 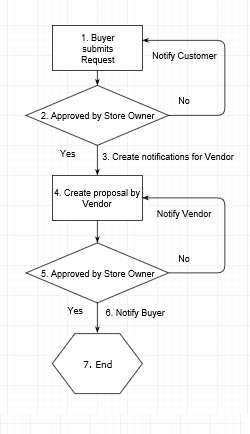 In Step 3 of this flowchart, we may want to create notifications and send message to all subscribers according to their preferences on a request, so that they will receive automatic emails about new product request. However, if the Store Owner denies the request we will want to notify the Buyer, but if Store Owner approves the request we need to notify the Buyer and all subscribers. In other words, in this example adding notification is an activity that we want to happen when an entity reaches a certain state, and sending email is an activity that we want to happen when a certain transition is followed. We need to design for both scenarios. Send Email: Specifies that we should send an email to one or more recipients. /// Send Email: Specifies that we should send an email to one or more recipients. Create product: Specifies that we should convert entity to nopCommerce product. Create notifications: Specifies that we should create notifications to subscribers according to their subscriptions preferences. You could define quite a few more kinds of Activities, but for now we'll just use those three. In this post, we demonstrated what kinds of Activities can be kicked off by certain States or Transitions. We still have a piece of all this missing, though: exactly who can actually perform the Transitions? We'll answer that question in the next post, Part 6 of this series, where we will discuss Security.